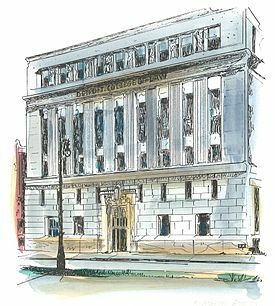 For those of you who attended the other law schools, 130 E. Elizabeth was the address of the venerable institution known as the Detroit College of Law, which graduated thousands of the best lawyers the City has ever known. Its consolidation into the MSU College of Law created a fitting legacy to the greatness of this college, but many of the graduates of the little building on Elizabeth Street were left with a less than connected feeling to the institution, which is now an hour and a half away. This section seeks to fill that void. The graduating classes from 1973 through 1996 were represented at the inaugural meeting. Going forward, the Bar will be handling the Section’s administration, while Section members plot its direction. Some of the ideas bandied about at the initial event at the Rusted Crow, attended by no less than our Chief Judge, Robert Colombo (’73), were for social events, guest speakers, fundraising and scholarships. We will have updates on this soon. If you are a DCL grad, join this section today! If you know DCL grads who are not Bar members, tell them about this opportunity to preserve the legacy of a great institution. Non-DBA Members: Go to the Join page and select the 130 Elizabeth Section membership.